It's time to say goodbye to paper! The WP9309 Environment-Friendly Paperless LCD Writing Tablet is designed to save paper sometimes. Erase your image or words with only press of a button.Perfectly suitable for children graffiti and other people like designer, business man, teacher, students and artist. 1.Newest model, fashion and stylish design, best and brighter LCD screen, unique and the most affordable in the market! 3. Good toy and learning tool for children in daily life and study.Good for writing, arithmetic, spelling and drawing practice.Good way to help establish children's awareness of environmental protection simultaneously. 4. Good tool for family/ party fun activities and white-collar workers in offices! 1. Don't use it in dimly lit areas. 2. Normally one button clear all thing. 3. Avoid using in the following condition as temperature higher than 40℃, blew 5℃. 4. Writing tablet can't connect to computer and can't save images. 5. APP(idoodle) compatible with most mobile phone in Android 4.3 or above, and IOS 8.0 or above. 6.The writen force can't be too large or too small, 150g -250g of writing pressure is ok.
7. It's easy to scratch the screen when the writen force is too large or use some sharp objects. No need any reason, as long as you are not satisfied with this LCD writing tablet, you can choose to return, exchange or refund anytime! 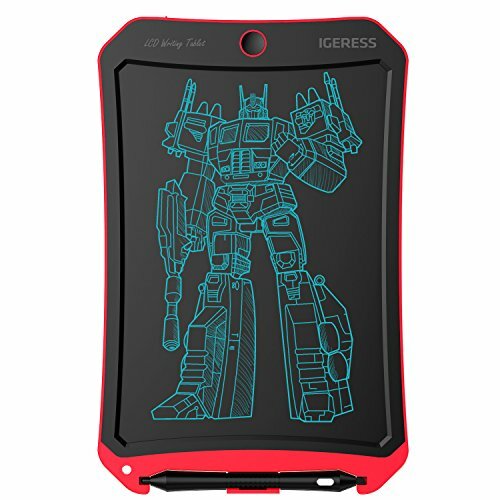 Newest Fashion Design: This electronic writing tablet with cool robot element design and red color is really funny, fashion, beautiful and unmatched, let kids happy to learn and entertain with it! New Generation Flexible Brighter LCD Screen: More delicate and brighter lines, Restore real touch, Drawing like as using paper, Rich pressure sense, Free to draw a thick and different smooth lines! Replaceable and Durable Battery: Low-power design, erasing repeatedly more than 50000 times; You can replace the battery yourself, also the kids can't open the battery cover themselves in order to avoid swallowing! Anti-erasing Button: This LCD writing board has a anti-erasing button on the top, it's very useful for anti-inadvertent touch when writing or drawing on it with opening the button! Double Pen and Anti-lost Stylus Storage Design: The LCD writing tablet will has richer lines with double pen design and the stylus are hard to lost with the anti-lost stylus storage design! If you have any questions about this product by IGERESS, contact us by completing and submitting the form below. If you are looking for a specif part number, please include it with your message.